The Public Art Manager is a key position responsible for engaging the community to participate in the Bloomberg Public Art Grant activities over the course of the next two years. Outreach and promotion of the Grant, including speaking to local schools, boards, committees, and non-profit groups will be vital to its success. Reporting to the Director of Development Services, the Public Art Manager will also bring vision, leadership, and continuity to Coral Springs Public Art Program, established in 2003, and implement the vision of public art expressed in the Coral Springs Public Art Master Plan, passed 2014 and currently under review to update again. Because of the varied nature of this position, the Public Art Manager must possess top-notch administrative and coordination skills, including excellent written and verbal communications, advanced software skills, and strong analytical, organizational, and program planning abilities. Experience in the administration of public art or exhibition programs is highly preferred. The most successful applicants will have experience working with artists, commissions and/or non-profit boards, artist selection processes, public construction projects, design professionals, and contractors. Work Location: Work station available in Community Development Division, however, time is also spent independently. Special Requirements: Proficient in Microsoft Office (Outlook, Work, Excel, and Power Point), Adobe Acrobat and social media platforms. • Community engagement and outreach for the $1 million Bloomberg Grant recently awarded to Coral Springs. • Assist in the installation of the five temporary public art projects in coordination with project stakeholders, including managing the contract process, project implementation, documentation and community education. • Connect with artists, residents, business owners and other stakeholders to determine and implement the Bloomberg projects and programs. to create a stimulating environment that reflects and enhances the City’s heritage, diversity and character through the public artworks integrated into the architecture, infrastructure and landscape. 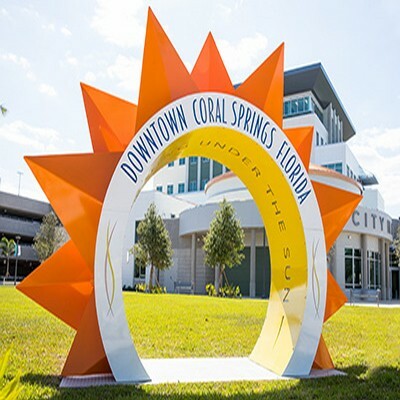 • Work with the Coral Springs Public Art Committee to review and improve the Program. • Develop programs and partnerships designed to inform and engage the community with public art in Coral Springs. • Pursue partnerships and funding opportunities to support the vision and goals of the Coral Springs Public Art Program, including researching and writing grant proposals and cultivating donors. • Actively champion public art and serve as a resource to planners, developers, property owners, arts organizations and artists interested in pursuing public art projects Downtown. • Oversee design and production of appropriate program materials, website, social media, presentations and other materials to promote and support public art Downtown. • Professional level knowledge of arts program administration. • Strong organizational skills and the ability to perform and prioritize multiple task seamlessly and with excellent attention to detail. • Strong interpersonal skills and the ability to build relationships with internal and external stakeholders. • The ability to develop and manage an annual budget. • Comfortable with meeting facilitation and public speaking in small group settings. • Proactive problem solving and decision-making capability. • Comfortable with ambiguity; adaptable to various competing demands. • Highly resourceful team player, with the ability to work independently or with a group. • Demonstrated ability to manage time and meet deadlines in a fast-paced and changing environment. • Educational background in arts administration, the visual or performing arts, nonprofit management, or a closely related field preferred. • Thorough knowledge of public art field preferred. Five years’ professional work experience in arts administration or related public art, gallery, corporate, architectural, project management or design experience. • Experience with grant writing and fundraising preferred.